Counting down to the start of this year's Urban Sketchers Symposium! 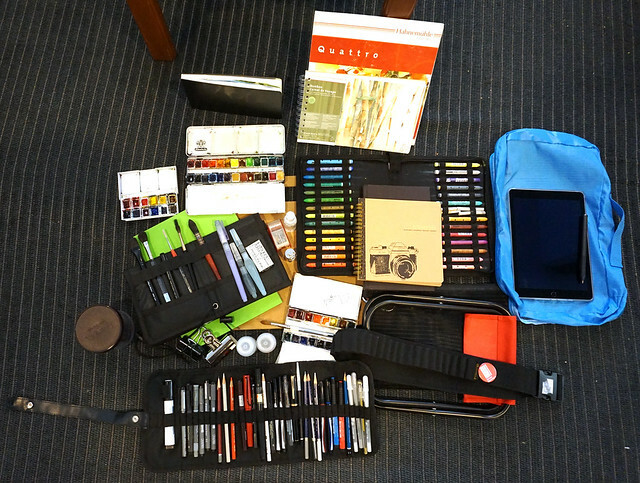 This year it's in Chicago, and here's what I'm bringing along. This will be my seventh symposium - missed the first one but have been to every single one since. This year, I get to sketch in Chicago AND see "Hamilton" - squee! I've gotten the symposium packing mostly down to a science. Basically, I copy the materials lists from all the workshops I'm taking into one document and then go through my studio pulling items. Then I edit. I add some of my own favorite supplies. Then I edit some more. Of course, I'll also take along a waterproof tote/backpack, an ammo belt (for pens!) a folding stool, hat, water bottle, etc.